This is a really quick and easy summer recipe, leaving you plenty of time to enjoy the sunshine outdoors. Preheat the oven to 200°C, gas mark 6. Halve the peppers from tip to stalk, then remove the seeds and trim the stalks. Brush inside and out with a little of the olive oil and place skin-side up in a small roasting tin. Roast for 10 minutes then turn over and spread the tapenade into the cavities of the pepper halves. Scatter with the sliced onion, garlic and half the shredded basil. Roast for a further 10 minutes until tender and browned. Transfer the peppers to 2 serving plates. 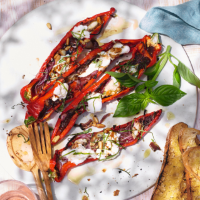 Arrange the torn mozzarella over the peppers and scatter with the pine nuts and remaining basil. Whisk the rest of the olive oil with the balsamic vinegar and some seasoning and drizzle over the peppers and cheese. Serve with warm ciabatta and salad leaves.